The Original And Best Daimler State Limousine Wedding Car Hire For Kent. Don't Miss Out. Best Prices & Free Offer. 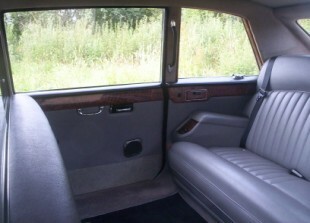 Daimler DS State Limousine seats 7 passengers for weddings in Kent & Medway. Many brides & Wedding planners have discovered the CLASSIC DAIMLER DS STATE LIMOUSINE, finished in slate over silver coachwork, with dove grey leather interior, is the perfect wedding car.Traditionally used by royalty, it has the finest styling and more space than in any other car. The spacious interior will accommodate the bride with a long train or a full compliment of bridesmaids with seating for 7 people, often used as Bridesmaids car to the Rolls Royce Silver Cloud. Prices from £275.00 for a local to base wedding and the low season. THE DAIMLER STATE LIMOUSINE WEDDING PACKAGE.